The surface of a pool near the Imfolozi river ripples as a white rhino, its young calf close by, lowers its mouth to drink. Rhinos have roamed the Earth in such a way for 40 million years. Humans, by comparison, are new kids on the block. Yet it is modern man that threatens to drive these stately creatures to extinction. Figures released last week show that 558 rhinos have been slaughtered in South Africa so far in 2014, putting it on course to be the deadliest year of poaching since records began. Well-armed gangs continue to run riot, shooting the animals with impunity and hacking off their horns, said to be more than worth their weight in gold on the black market. Now conservationists warn of a new threat – voracious mining – that could drive the endangered animals to the brink. 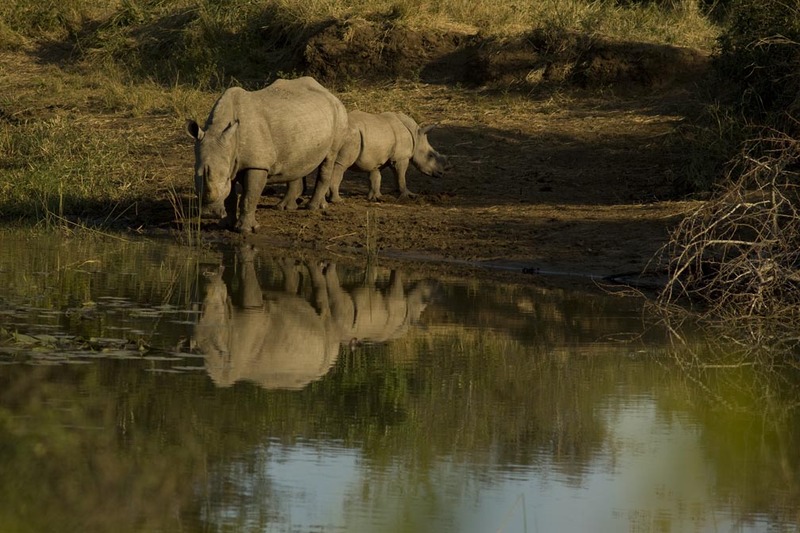 The Hluhluwe-Imfolozi park in KwaZulu-Natal province, a natural oasis abundant in elephants, leopards, lions and more than 300 bird species, is arguably the world’s greatest rhino sanctuary and ground zero in the battle to save them. Once the exclusive hunting ground of Zulu king Shaka, it is the oldest protected wilderness in Africa, proclaimed in 1895, and the scene of one of the most inspiring conservation success stories of the 20th century. By Jeffrey Barbee and David Smith, text special for the Guardian Newspaper. The film below produced by Jeffrey Barbee and assistant producer Nicholas Raphael. Scroll down for our television feature on this story, shown on Public Television in 2015. Check out the slide show of unpublished images. Contact us if you would like to have prints of the images or a high resolution version of the film. This entry was posted in Climate Change, Environment, Video Reports and tagged alliance earth, allianceearth, barbee, coal mine, fuleni, guardian, ian player, imfolozi, jeffrey, mining, Nicholas Raphael, poaching, rhino, water pollution. So sad. What chance do the local people and animals have? I think that there must be more that can be done to save these animals…so many animals are facing extinction and most are because of greedy selfish men….our grandchildren won’t have the chance to see these animals at all..what will be left? I wonder what goes through one’s mind when the brutally kill these beautiful innocent animals!